As I mentioned in my initial thoughts on Battlefield Hardline, one of the key aspects that sets Visceral’s shooter apart from other Battlefield titles out there is it’s core focus on transportation vehicles and the inclusion of mean rides like muscle cars, police cruisers, and speed bikes. I had quite the blast speeding through the streets of down town Los Angeles as my partners in crime or fellow officers hung out the rear and passenger side windows with assault rifles, machine-guns, and shotguns at the ready. I could easily get lost in fun, ignoring the objective completely. But as it turns out, the new additions to Hardline’s garage are perhaps at their most effecting when “PTFO”-ing. During my recent visit to EA’s headquarters in Redwood City, CA, I asked Visceral lead multiplayer designer Thaddeus Sasser what sort of new possibilities Battlefield’s new cops and criminals theme brings to the table that might never fly in a tradition Battlefield game. He too mentioned the new direction with vehicle gameplay in Battlefield Hardline. “Some of my favorites are the transport vehicles. We’ve got sedans with no guns on ’em. But these are key to some of the game modes, right? But what about the vehicles that traditionally have played a key role in the ‘true’ Battlefield experience? Where are the battle tanks, fighter jets, assault choppers, and attack boats? 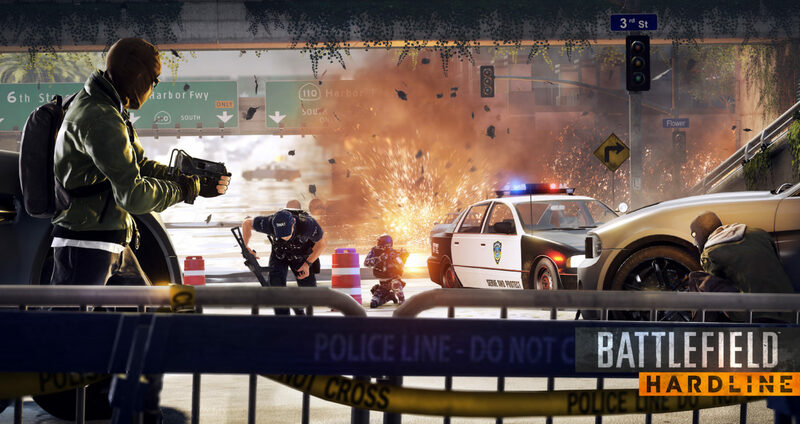 It can be hard to let it sink in that Hardline is not a military shooter, after all. As with the weapons, gadgets, kits, and locations, Visceral had plans all along to stick to the fiction, even if that meant taking Battlefield in an entirely new direction. Despite the new approach, Sasser assured me that Hardline will still support the same range of options previous titles in the series has before it, as it’s still a deeply engrained element in the franchise. Hopefully, there’ll be a little bit of something for everyone. Find out October 21 when Battlefield Hardline launches on PC, Xbox One, PlayStation 4, Xbox 360, and PlayStation 3.